Get 4 Rafting Tickets and 2 Zipline Tickets with ANY August Booking @ The Bear's Den!!! GET 4 RAFTING TICKETS AND 2 ZIPLINE TICKETS WITH ANY AUGUST BOOKING!!! EFFECTIVE 8/14 - "REGULAR SEASON" RATES APPLY! - $145/NIGHT. MINIMUM NIGHT STAY LOWERED TO 2 NIGHTS FOR AUG. Excludes holidays. Only available on new reservations booked after Aug. 12, 2011. Offers cannot be combined with any other special. Free night offer represents the least expensive night of the stay. PAY FOR 3 NIGHTS - GET THE 4TH NIGHT FREE! PAY FOR 5 NIGHTS, GET THE 6TH & 7TH NIGHT FREE!. Not valid over Labor Day Weekend. Only available on new reservations booked after Aug 12, 2011. Offers cannot be combined with any other special. Free night offer represents the least expensive night of the stay. Book your reservation at the Bear's Den TODAY! 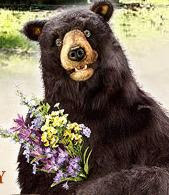 Call Toll Free: 800-473-3163 and ASK for the Bear's Den! Bear's Den - Winter Magic and February Sweetheart Specials! One night FREE on three or more night stays! Only available on new reservations booked after December 11. This offer cannot be combined with any other special.Free night offer represents the least expensive night of the stay. Pay for 5 nights, get the 6th & 7th night free. Only available on new reservations booked after December 11. This offer cannot be combined with any other special. Free nights offered represent the least expensive night of the stay. One night FREE on three or more night stays! Only available on new reservations booked after January 8th. This offer cannot be combined with any other special.Free night offer represents the least expensive night of the stay. One FREE night on 7 night stays. Cannot be combined with any other specials. Stay one night at the Bear's Den for $.75 cents on any 3 or more night stay! 75th Anniversary of the Great Smoky Mountain National Park Special*! 2 Nights Free on 7 night stays. Only available on new reservations booked after July 21. Free nights offered represent the least expensive night of the stay. 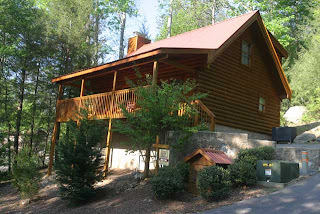 Reserve the Bear's Den cabin on-line! 1 Night Free on 3 or more night stays. Only available on new reservations booked after May 1. Valid for 3, 4, 5 or 6 night stays. Free nights offered represent the least expensive night of the stay. 2 Nights Free on 7 night stays. Only available on new reservations booked after May 1. Free nights offered represent the least expensive night of the stay. 10% Off 3, 4 or 5 Night Stays on bookings made 30 days or more in advance. Only available on new reservations booked after May 1. Must be booked 30 days or more prior to arrival to receive discount. There are many thousands of vacation rental properties available on web sites, through rental agencies, and listing sites. Finding the perfect one for your vacation can be quite a challenge, and sometimes even when you feel you have found just the right one for your family, there is a good possibility that someone gets there before you, and you lose the week you want. Here's a few secrets from vacation rental owners that may help you find the perfect place, create a great relationship with the owner, and have the most amazing Smoky Mountain vacation. 1 Remember that you are not reserving a hotel room.Owners who rent out their homes are real people who have spent much time and effort on making the place comfortable, ambient and fully equipped for their rental clients. A good rental will provide you with all the comforts of home, a well decorated environment, entertainment systems, a kitchen with everything you need to create family meals, and comfortable bedrooms. The owners are likely to be very proud of their home and only want to rent to people who will appreciate it. This means that if you treat them as you might a hotel or resort reservationist, they might just turn your request down. From my own experience, I like to have people in my cottage who I think will respect and enjoy the experience of staying there, so I want friendly renters that I can chat to on the phone and assess if they are right match for my property. 2 When you speak to the owner or agency, don't be vague about the number of people in your rental group. When they ask 'how many people do you have', don't reply with, ' I'm not sure yet', or 'we haven't decided how many people will be coming', as this will start alarm bells ringing in the owner's mind. One of the greatest fears that a vacation rental owner has is that they will rent to a group of people who see the property as a 'party house' and invite all of their friends to come along and share the accommodation. Be specific about the people who will be in the rental group and respect the owner's accommodation limits. 3 Accommodation limits are usually determined by several factors. Firstly, the owner may simply decide to set a limit on how many people he will accept in the property based on the potential for wear and tear. This is his choice, and should be respected. So even if the property listing says it has five bedrooms, however the accommodation limit is set to six, resist the temptation to argue that since there are beds for at least 10 people, that is how many you will bring, as this will not endear you to the owner who may well end of the conversation there and then. The second factor is one that is common to many country properties that are not serviced by township septic and drainage systems. These places will have holding tanks or septic tanks, both of which have capacity limits which will place a restriction on the number of people the property serviced by the systems can accommodate. These limits are usually based on headcount so there is no difference between adults, children or babies. We often hear rental clients saying, 'they're only babies, they don't use any water, and they are in diapers anyway'. Even though it's quite a long way in the past, I can still remember that I bathed my babies quite regularly, and usually in the bath tub using more water than a shower would take. 4 Before you start e-mailing or telephoning an owner with a long list of questions, please check that the answers are not already shown on a web site or rental listing.Many owners have comprehensive web sites that provide all the information you need, and although they are happy to answer any additional questions, it is very helpful to them if you have already read the listing. If the property is very attractive and popular the owner may be receiving numerous inquiries every day and may be very selective about who they will rent their property to. Bombarding them with questions about features and facilities that are clearly shown on the listing may not result in a favorable response. 5 Many vacation rental owners welcome pets; many do not.Please don't expect an owner of a non-pet-friendly property to accept your 'adorable, well-trained, hypo-allergenic, Labra-doodle-poo', even if it is crated, kept under control at all times, and 'never allowed on furniture or beds'. If the owner doesn't like dogs or cats, you won't change his mind by pleading or asking in a dozen different ways. It would simply be better to either accept you have to put your pet into kennels, or find another property. In any case, wouldn't you prefer to bring your much loved pet to a property where he or she is welcomed with a few dog treats? I have owned several vacation properties over the past 20 years and have met many people, some of whom are now good friends. Along the way, I've learned a lot about my rental guests, what they expect, and how I should provide a space that is just right for them. As a responsible owner, I work hard to create that space and offer good value for money, and in return I simply look for respect for my property and an appreciation of the special nature of a rental vacation. This type of vacation is not right for everyone, and if you are looking for the type of sterile, impersonal environment found in many hotels and resorts, then a vacation cabin may not be right for you. On the other hand, you may find that once you experience vacation rental for your family, you will never take any other type of vacation again. Gatlinburg, TN - Should We Stay In a Log Cabin or Hotel This Year? Vacation home rentals have many perks for travelers. They are generally much cheaper to stay in than hotel rooms, and there are several things you can do to guarantee yourself that you save money on your vacation home, get the best price available and have a cheaper vacation. A vacation rental is much more spacious than a hotel room. Instead of being cramped in a small room, you have an entire home for you and your family to stay in. The benefits don't end there, though. Vacation home rentals almost always have full kitchens. (Double check that the vacation home you are considering has this just to be sure.) You can shop for food at a grocery store and prepare your meals at the vacation rental. This allows you to eat at home and save money on food, instead of spending a great deal of your vacation budget at restaurants. Another benefit of vacation home rentals is that they are more personal than hotels. The people who own the home are able to make recommendations about things to do and where to go. Homeowners want to help you and provide you with the best experience possible so that you recommend their home to your friends and family, and come back again yourself. In order to save money on your vacation rental, consider traveling with another family and renting a home with them. This would cut the cost of your vacation home in half. Also, the longer that a home is rented for, generally the cost decreases. Rent a home for twice as long with another family, and each family spends half of the time there. The cost will most likely be cheaper for you than just renting for the time you would be there. To find a vacation rental that suits you and your desires for your trip, you need to do plenty of research. Look on the Internet for pictures and reviews. Compare amenities, such as fitness centers, in addition to prices. Ask any family members or friends who have stayed in a vacation home in an area you desire to visit if they would recommend the place where they stayed. Another important consideration when looking at vacation home rentals is the location. How far is it from town and restaurants? What is the distance to the attractions or the mountains or whatever it is that interests you in this particular location? Often times vacation homes are booked well in ahead of time. It's common for a family to book a year in advance when their trip ends, so it's important to plan ahead to find the best deal. Occasionally there are last minute travel deals available, so don't forget to check those out for this summer. You also should be aware that many vacation home rentals require a deposit when you book, and if for some reason you are not able to take your trip and rent the home, you could lose that deposit. So be sure to check out the deposit and refund policy of the vacation rental. Vacation home rentals are a great way to save money on your vacation. They also have a more comfortable, inviting atmosphere than a hotel can provide. When planning your next trip, check out the Bear's Den to save you money and provide you with a more relaxing environment.